As the semester gets closer and closer to an end, lots of preparations must be made for the switch from first semester to second, including getting ready for finals. A big part of being in a class and learning is making sure you learn all the information you can to pass and hopefully get a good grade on the final. Finals main purpose is to test for the information that is expected to have been learned in that class. While finals can be very useful for teachers and administrators, there is also some negatives to standardized testing. Many agree that they don’t actually test for the intelligence of a student and that it has more to deal with how good of a test taker they are and only a very little part of the skill sets learned in a class. I talked to Mrs. Love a English teacher here at Reynolds and she brought up the fact that more English standardized testing is made up of mostly reading comprehension with reading passages and answering questions on it. However, English classes are made up of many components like presenting skills, creativity building, writing and many other factors that are not including in the testing for these classes but play a big role in the teachings. Another big part of finals is the process of preparing for them. It’s very hard for both teachers and students to have to come back from a long winter break and go straight back into class and reviewing for finals. Many teachers struggle with trying to review about five months of information into 2-3 weeks of review and making sure they’ve completed teaching the curriculum for these classes. To help make sure the students remember all they’ve learned teachers use various resources. Some teachers prefer to have all their students to keep lengthy notebooks with all the topics and units covered during the semester. 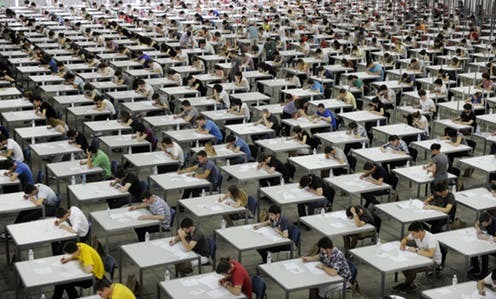 Other resources like practice test from things like released previous finals help to give students a certain idea of how the test they are taking might be like. People learn in many different ways so one way of review might work for one student but not another, so it’s important to use many strategies for finals preparation. No matter how you prepared for finals and what your view on standardized testing, it’s important to try your best and study any way you can. Good luck to all the students with their finals this week, you can do it! As stressful as finals week and the transition between semesters can be for students, it’s hard on teachers too. They have to administer tests, grade, and on top of that they only have an early release to get everything ready for the transition this semester. On top of all that, they have to memorize new students, for some, get used to student teachers, and overall it’s a very stressful time for teachers. I talked to Mrs. Lewis about how the transition is going for her. 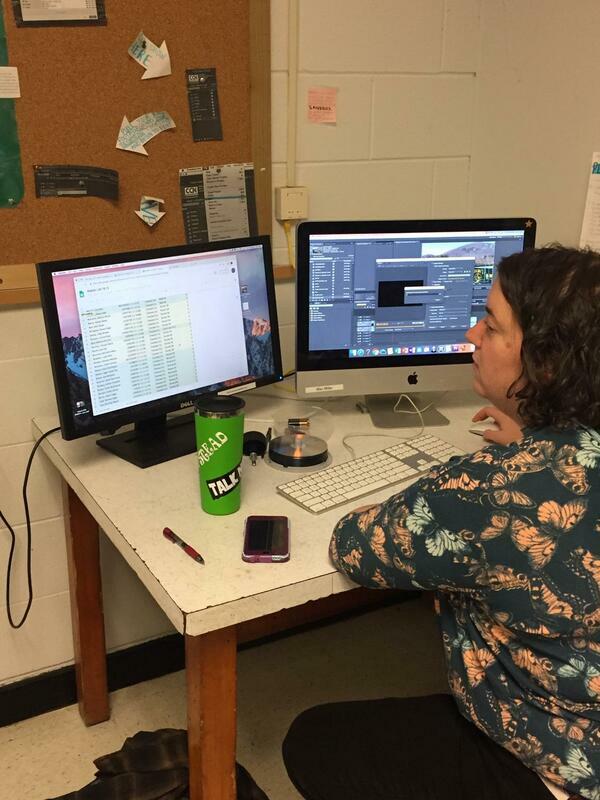 “I need to finalize grades, finish grading, review with students, bridge the AP calendar to make sure that both my AP classes are roughly in the same spot, and congratulate the seniors because this fulfills their graduation requirement”. That’s a lot for a normal day, and on top of that, because of the snow, teachers only have the afternoon of the early release on Friday, January 18th to finish all of it that needs to get done before the switch, which is insane! We get stressed whenever we leave a project for the last minute, but this is three projects and a forgotten make-up test due in an hour. Teachers have to work as hard as they can to get everything done, and it’s really stressful for them. When asked what the hardest part of the switch for her is, she says that it’s “Trying to wrap up one, start another one, and especially in the APs, it’s a challenge to keep up and maintain the necessary rigor” which is something I think all of us can understand. But for teachers, they also have to learn names, answer questions, and a lot more that students don’t have to deal with, so it’s a lot harder on them. So for the next few days/ weeks just keep in mind that teachers have a lot on their plates. Be kind, do what they ask, and be patient if your new teachers don’t remember your name at first. They’re doing a lot at one time, and you can’t blame them for being a little bit frazzled. Teens today are much more prone to stress, anxiety, and depression than kids were in the past couple decades yet it is something not many people truly address. I read on childmind.org that one third of kids today will meet the criteria for an anxiety disorder by the time they are 18. It is something that is progressing at an alarming rate. The world around teens is a new and constantly changing place with the texting, and tweeting, and changing of status on social media. We regularly look at electronic screens and absorb other people's lives. In this process we compare the lives of others to our own, especially teens. We decide our bodies, friendships, fun, and lives are lesser than that of other peoples. We are comparing ourselves to live up to standards of other people’s lives instead of focusing on the life in front of us. Not only are we doing it but we can’t stop. An article on phychologytoday.com talked about how one reason we are doing it more is because the devices we use are addictive. We have a compulsive need to look at our phones leading us to scroll social media and once we do we can’t stop because it triggers a dopamine release giving you a sense of pleasure. I also found that teens today are more pressed than ever when it comes to getting good grades. Not to say students of the past decades haven’t been stressed about grades but today they are more inclined to get perfect grades. Students think as though good grades mean a successful and happy life and bad grades mean failure. Plus, more students than ever receive a secondary education, many even though it's not really what they want. They have been taught that it is necessary and to get there they have to have perfect grades and impeccable test scores. While students in past times have strived to get good grades such as B’s or the average, C’s, teens now find themselves pressured to have top scores and straight A’s. Many people would say this is kids working harder and it is true. However, in order for kids to do this work they stress and continually compare themselves to other students, leaving them feeling inadequate. Teens deal with stress, anxiety, and depression in many ways. Many teens feel isolated, tired, and down when they have these things. So to deal with it many people find being out with friends, getting good sleep, or just doing something you love can help you cope. I spoke to a student named Sierra who told me that exercise is an excellent way to feel better. Teens can also practice mindfulness techniques learning to control things such as breathing and focusing to help them feel better. The problem is some students don't turn to these things to cope. They turn to alcohol, drugs, self-harm, and even teen suicide. Teens find the worse things as the easier way out. Teachers need to know how to locate and handle students with these problems. I spoke to Mr.Johnston on what to look at it when determining if a student is suffering from extra stress, anxiety, or depression. We need to bring attention to these problems and feelings in order to teach students how to properly and safely feel better. AP classes: to take or not to take? 1955 - ‘56 school year The College Board, a nonprofit dedicated in expanding access to higher education, took over the administration of the program: renaming it “The Advanced Placement Program.” It began that school year with 130 schools and 1229 students, just last year the program had over 1200 school with 525,000 participating students. Though the popularity of these Advanced Placement exams continues to increase many still raise the question: are these classes worth it? The appeal to take AP classes, for most students you ask, is relatively the same: “to help boost my GPA”, “to help improve my odds for getting into a good school”, “to make me look more competitive for college,” remark students Chris Bridges, Lawson Robertson, and Zachary Crain respectively. The motives for taking these classes are almost always academically driven; students rarely take these classes of their own volition. In fact, many student feel forced to take Advanced Placement classes, they feel it necessary in order to get into a good college. “I mean, in a way, it feels vital to take AP classes, otherwise you’ll be behind everyone else who are taking these classes when it comes time to apply to college.” admits senior Lawson Robertson. Crain. It seems some students understand the competitive nature of college, and any move they can take to get ahead now is of great importance, even if it's just preparing for college in an academic sense, such as with more rigorous classes. All in all, there are great colliding forces in the decision to take or to not take Advanced Placement classes. Some back off for fear of their inherent rigor, some give in in attempt to stay ahead, or with, their peers. 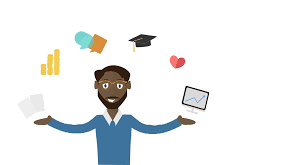 In the end, it’s up to what kind of student you want to be: do you want to push yourself academically or do you want to float comfortably through high school? Career Technical Education Classes, also known as CTE classes, do more than just teach students to pass a test or memorize information. With many different topics to choose from, they prepare students for their future and help them know what to expect in the real world after high school. But with all the classes to choose from, some students still are unsatisfied. An “appropriate dining knowledge and attire,” CTE class would make Jackson Wright very happy. Some other ACR students suggested that we should have more CTE classes, too. These classes include small business start-up, owning and managing a farm, video game designing, and peer-student counseling. All in all, you can see that CTE classes definitely prepare students for their lives outside of high school, no matter what they plan to do in life. Whether their plans involve going to college, the military, or even straight into the workforce, CTE can always provide students with something meaningful to learn. The school counselors here at A.C. Reynolds High School work very diligently to keep their students on track to graduate and accomplish their academic goals. Many students seem to underestimate the rigor and challenge that our counselors face; with roughly 300 students per counselor, each counselor undoubtedly has their hands full as far as their career is concerned. Regardless of the plethora of work these counselors have on their plates, every single counselor graciously shares their time to help each student with their academic goals and struggles. An important example of these many crucial processes is the department’s exclusive role in academic advising for the student body, “Academic advising is vital to a student's success. Without the consult from a school counselor the student may not have the right information to adequately prepare for whichever opportunities present themselves after graduation,” remarks Ainsworth. “[The counseling department] needs to make sure that the students are in the appropriate classes for graduation and that no one falls through the cracks.” Say Ms. Kohn, a counselor here at A.C. Reynolds.